Located on Martin Street and Cork Street, this park is nestled in by the Saugeen River and is great for hiking on the trails. 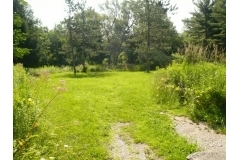 The trail system connects major park areas within Mount Forest utilizing municipal property along the Saugeen River Valley and adjoining lands. There are a variety of landscapes to enjoy along the way from reforested areas near Campbell deVore Park to the riverscape along the Saugeen River and Wetlands project at Murphy Park. Information signage is located at Campbelll deVore Park entrance on Princess Street.